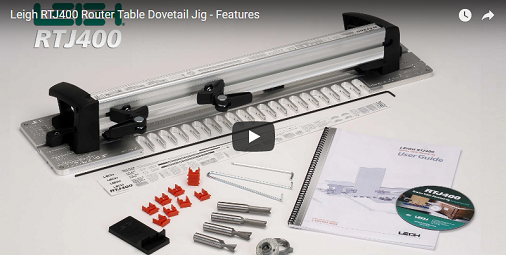 Patented technology allows the Leigh RTJ400 Dovetail Jig to make three types of joints on one template without any jig adjustments — an exceptionally easy method of achieving perfect joinery. 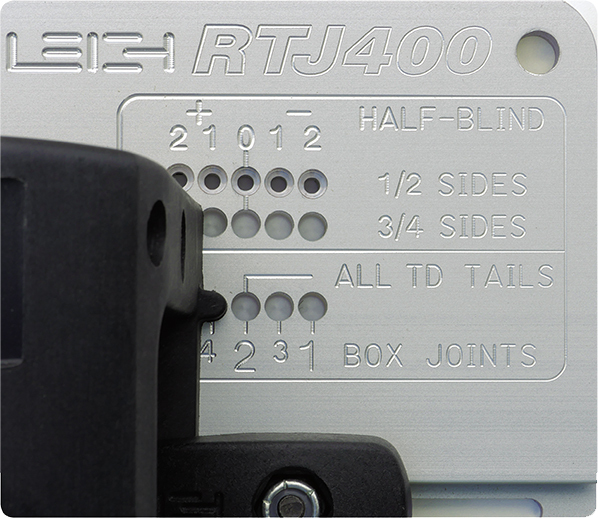 The RTJ400 makes it easy to achieve the classic hand-cut look of through dovetails at two different pitches. 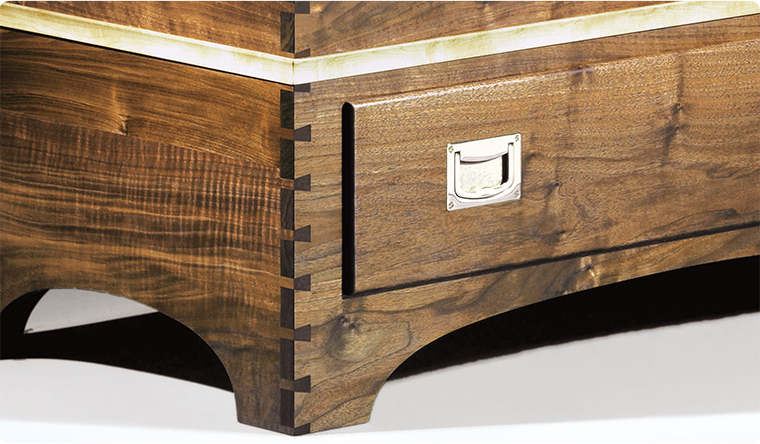 With full pitch (wide spaced) through dovetails, when routing the tails, blockers prevent routing in every other opening. 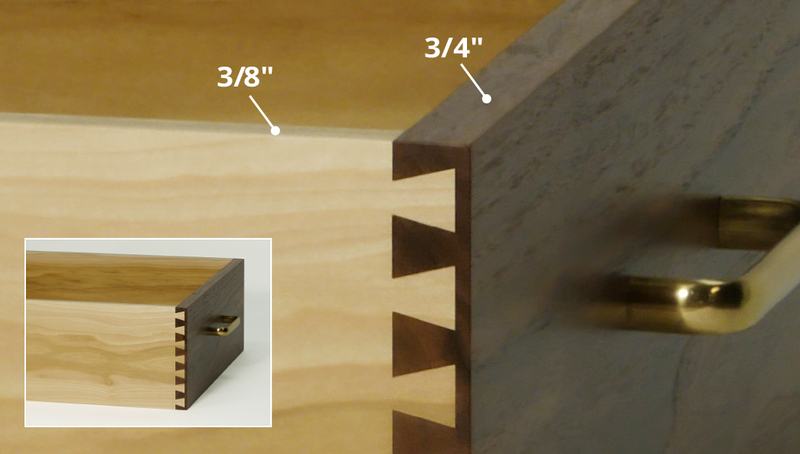 With half pitch (close spaced) through dovetails, when routing the pins, the template quickly releases and is moved to a new position to rout in twice as many openings..
Half-blind dovetails are often used in multi-drawer projects or for replicating period pieces. With combined vertical and horizontal board clamping (a first on any router table dovetail jig) and the precision offset sidestop, you can rout both boards at the same time. 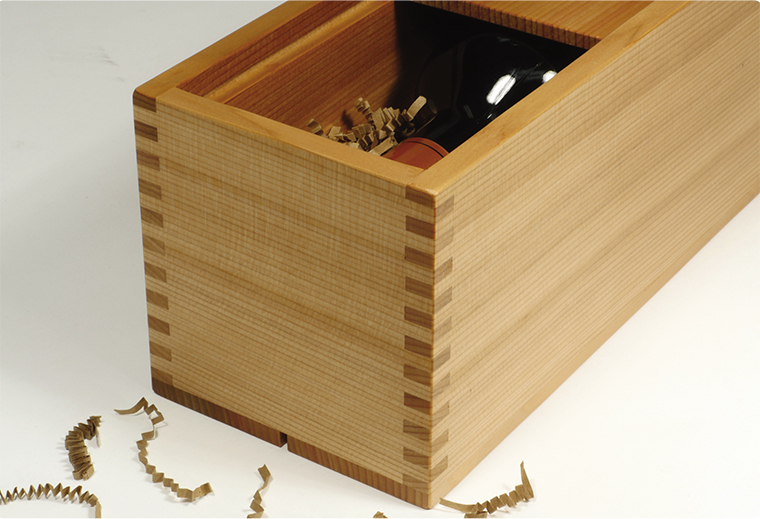 It's an extremely fast method of making half-blind dovetail joinery. A stop rod inserted through the template fingers limits the travel of the router to ensure the correct socket depth relative to tail thickness.. 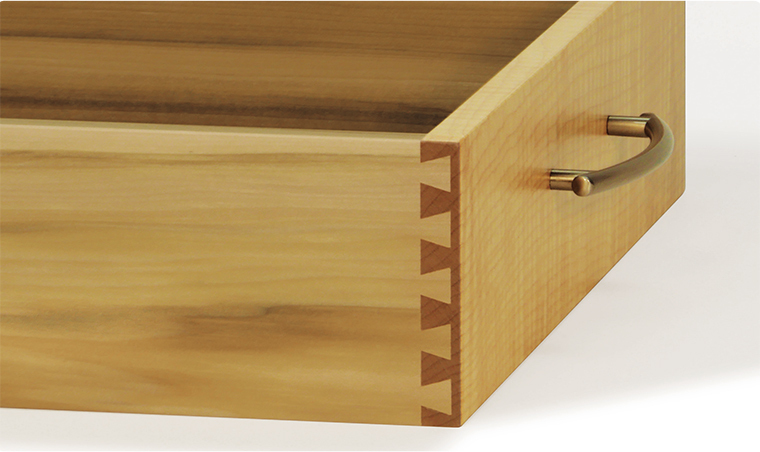 Box joints (finger joints) are known for their striking symmetry and strength. 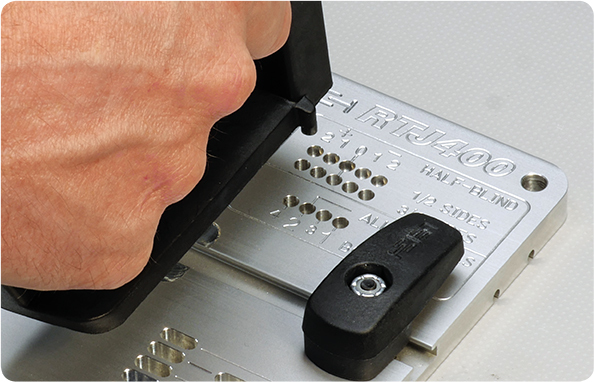 Four joint sizes, 3/4", 3/8", 3/16" and 3/32", can be made with the Leigh RTJ400 Template. Whether you're making carcasses or miniature pieces, the RTJ400 has you covered. With the RTJ400 you can easily join boards of different thicknesses. For example, drawer fronts are often thicker than drawer sides. 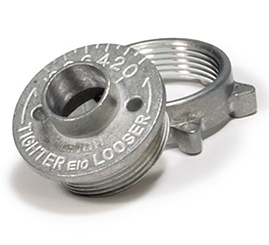 Joint fit is adjusted with the supplied e10 guide bushing that fits to your router. 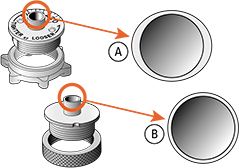 Its barrel is elliptical (A), unlike plain circular template guidebushes (B). When rotated, the effective diameter of the barrel changes, allowing fit adjustments as small as .001"[0.025mm]. Too loose If the joint is too loose, turn the eBush to a higher number. Too tight If the joint is too tight, turn the eBush to a lower number. 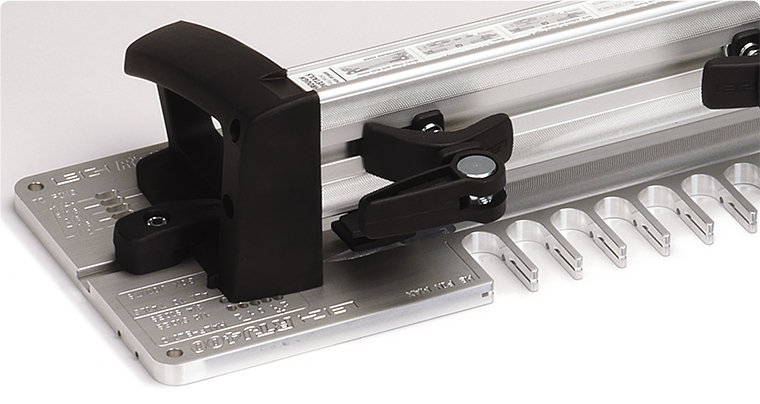 The RTJ400 template and frame are made of CNC machined aircraft aluminum for strength, yet light for portability and ease of movement over the router table. The glass filled nylon end housings are used to secure the frame to the template. The weight and size of the jig make it easy to store when not in use. Boards are held securely against a machined non marring, textured clamping surface by tough, glass reinforced, cam-action speed-clamps, easily clamped with one hand. Adjustable injection moulded glass reinforced sidestops provide accurate board positioning and have a built in offset for half-blind dovetails and even allow for rabbeted drawer fronts. 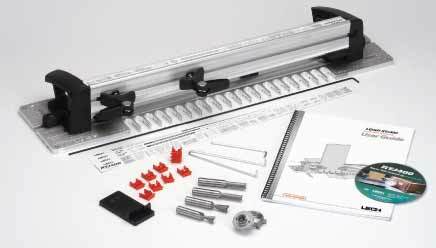 In addition to a thorough User Guide and Video, five instruction strips sit in the top of the jig for quick reference, making it easy to get started after time away from routing. The RTJ400 includes four Leigh brand bits, all with 1/2" shanks: A 1/2" 8° dovetail bit and a 1/2" straight bit for through dovetails, a 1/2" 14° dovetail bit for half-blind dovetails, and a 3/8" straight bit for box joints. Leigh Brand carbide-tipped router bits are among the best you can buy. 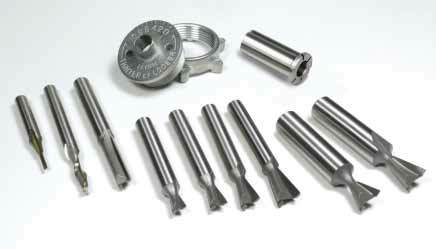 They are made with high quality C2 and C3 micro grain carbide for long bit life. Each bit is honed to a fine edge with 600 grit diamond wheels for smooth, efficient routing. All shanks are 1-3/4" long to handle the thickness of the finger assembly or accessory template. 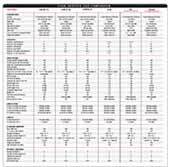 Leigh router bits are manufactured to ISO 9002 standards. NOTE: The Leigh RTJ400's actual comb pitch is 0.781"(19.84mm), therefore all joint sizes listed here are approximations of this dimension. Box (Finger) Joints, 3/32", 3/16", 3/8" and 3/4"